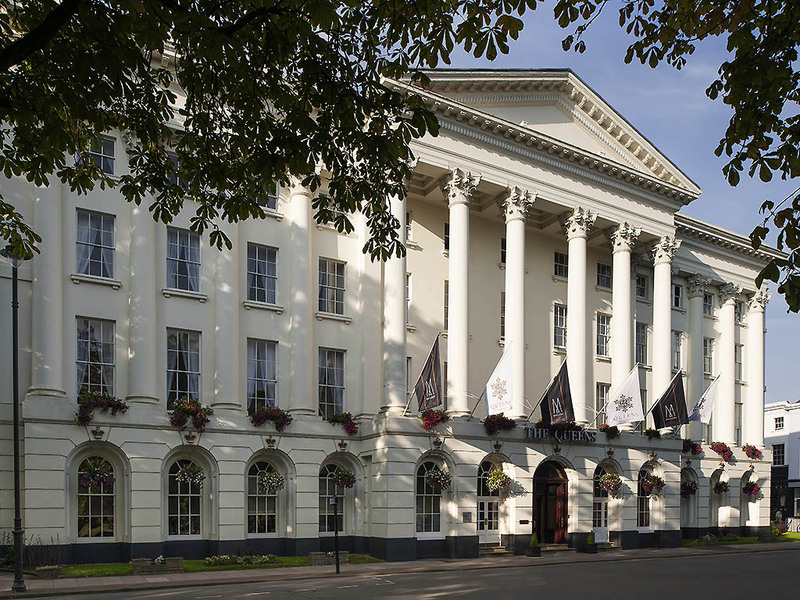 The Queens Hotel Cheltenham - MGallery by Sofitel is a grand and imposing Regency property sitting right in the heart of the picturesque spa town of Cheltenham, overlooking the beautiful Imperial Gardens and Promenade. .
Our room had everything we needed appreciated tea coffee and bottled water. The food was very good especially the choice at breakfast. Quick overnight for early morning meetings. Room was comfortable with great facilities. We had 2 nights here, Good service, clean well kept room, and excellent dining. Lovely stay. A real treat! My daughter and I were welcomed beautifully. It was very thoughtful to put fresh chocolate and nail varnishes in the room. The room was lovely and breakfast next morning was great. Also very nice to have waived parking fees for us. Excellent, great rooms, staff, breakfast, bar. I booked as a surprise for my boyfriends birthday and from the minute the cab pulled up it had the wow factor. Beautiful clean hotel and so much character. Perfect location walked everywhere. Staff were lovely but not intrusive. Left a card and amenity in the room for his bday which made it special. Room was a little on the small side but when we experienced the bed and pillows quickly forgotten. It was so comfortable I wouldn’t consider trying anywhere else and would like to stay again so can take advantage of the hotel more as we had a busy itinerary for the weekend. Always good at the Queens. Great room. fantastic breakfast and great staff. Nothing too much trouble. Please get some firm pillows or let me know you have them in. Great front of house. Nice size room. Beds very comfortable. Noisy room due to creaking floor boards above us. View of car park not great after spending £185 for a nights stay. Gluten free breakfast also not up to standard for £17.50 all I git was 2 slices of white toast and two rashers of bacon. The cakes given for breakfast, Mocha and ginger were pretty poor. Couldn’t have asked for more- all staff helpful and polite, delicious food, lovely room. Having to pay an additional £13 per night to park the car in the car park just put a dampener over our stay and is why I’ve not given 10 stars. The cost for this should be included in the overall price. Our 40th anniversary made special staying in your hotel. Hotel is beautiful, room was comfy, staff was attentive and helpful and breakfast was excellent. Front reception were most helpfull in upgrading our room. We enjoyed a two night stay in a superior room in a very central location in Cheltenham. We were therefore able to explore lovely Cheltenham for the first time. The room was lovely with all amenities. Our only criticism was a somewhat disturbing hum from the ventilation system at night. The breakfast was exceptional with a huge choice. A lovely hotel excellent rooms beds bedding facilities, friendly reception, ar resturant staff. Would defiantly stay again. Only thing that spoilt was the 3 knocks we received on our door on the Sunday morning . Due to check out at 12 so found like being forced out and rude. Only thing to spoil a good stay. Check in was excellent. The staff at reception were very friendly and helpful. We had chocolates and a card in our room to celebrate our anniversary which was a nice touch. Lovely clean room. Breakfast was tasty and plentiful but let down by the staff who were quite brisk in manner and not very friendly.